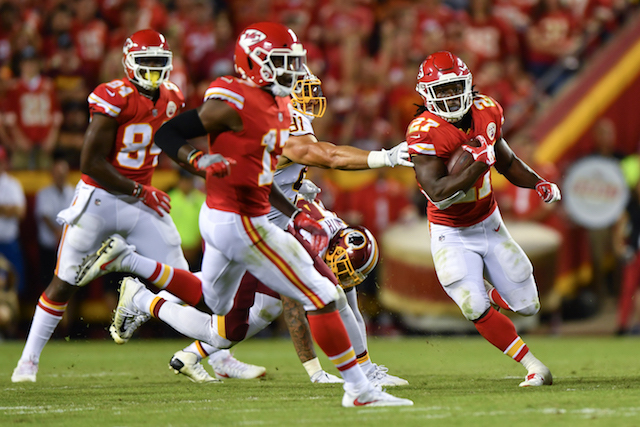 TMZ released a video on Friday of Kansas City Chiefs running back Kareem Hunt shoving and kicking a woman. The incident between Hunt and the 19-year-old woman occurred back in February in a Cleveland hotel. Police were called, but no arrests were made, and no charges were filed. Hunt was never suspended over the incident and has started all 11 games at running back for Kansas City this season. Hunt was drafted in the third round of the 2017 NFL Draft out of Toledo. During his rookie season, Hunt led the NFL in rushing with 1,327 yards. This season, the second-year rusher currently has 824 rushing yards and seven touchdowns on the season. Hunt is not the only Chiefs star to be plagued by domestic violence issues. Wide receiver and kick returner Tyreek Hill was expelled from Oklahoma State in 2014 for a domestic violence incident. As of Friday afternoon, neither Hunt or the Kansas City Chiefs have commented on the matter.